Did BBC News follow up this week's allegations of child abuse in Telford quickly enough, and in enough depth? All in positive territory tonight. off the air in the UK. a surprise to some people. appropriate for them to do so. as for the studio background. culpability for the spy poisoning. and recorded this video for us. to a portrayal of the Kremlin. Corbyn with Russia and Russians. see any of that here. had been abused since the 1980s. Are you going to cover this scandal? of child exploitation in Telford. with less than 50 cases. was to little, too late. of journalism by the Sunday Mirror. in our paper review on the Sunday. and we began to do that. he used the news app. That was on the England index. based on work with an academic. And we waited the story. We look at it in depth. is a really important new story. on the News at Ten on Tuesday night. because of partly our journalism. I really don't think it's the case. but also elsewhere in the country. of England based around Newcastle. and reports on these stories? but across the whole range. and how deep this ran. has had to reflect on. Thanks for your comments this week. Or you can e-mail Newswatch. And do have a look at our website. 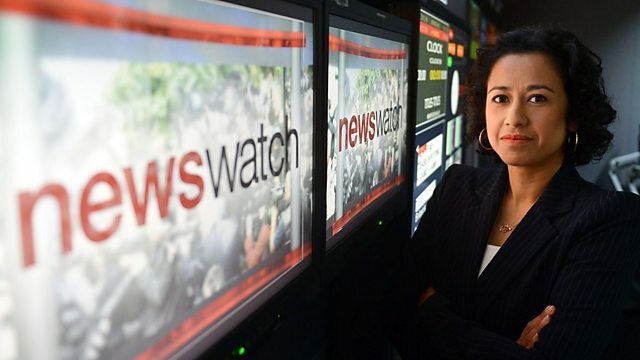 Viewers' comments about BBC News coverage, presented by Samira Ahmed. Did the BBC follow up this week's allegations of child abuse in Telford quickly enough, and in enough depth?